Rock_1…..................8076 polygon. .................................8078 vertices. Rock_1_Lod_1….......2768 polygon. ..................................1386 vertices. Rock_2…..................8135 polygon. .................................8137 vertices. Rock_2_Lod_1….......3168 polygon. ..................................1586vertices. Rock_3…..................12090 polygon. .................................12182 vertices. Rock_3_Lod_1….......4137 polygon. ..................................2158 vertices. Rock_4…..................6316 polygon. .................................6400 vertices. 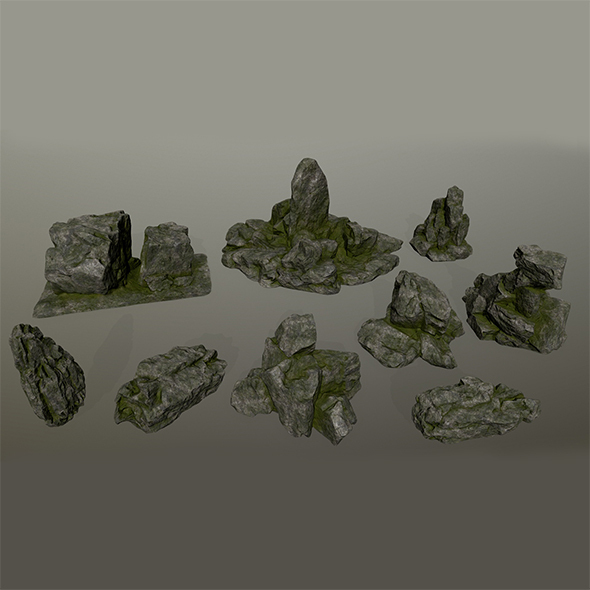 Rock_4_Lod_1….......2116 polygon. ..................................1140 vertices. Rock_5…..................6952 polygon. .................................6954 vertices. Rock_5_Lod_1….......3080 polygon. ..................................1542 vertices. Rock_6…..................14869 polygon. .................................14969 vertices. Rock_6_Lod_1….......6018 polygon. ..................................3106 vertices. Rock_7…..................11766 polygon. .................................11909 vertices. Rock_7_Lod_1….......3449 polygon. ..................................1866 vertices. Rock_8…..................13716 polygon. ................................13850 vertices. Rock_8_Lod_1….......5741 polygon. ..................................3001 vertices. Rock_9…..................7072 polygon. .................................7132 vertices. Rock_9_Lod_1….......3784 polygon. ..................................1950 vertices.